Many places around the world formally celebrate their history. Here the History Council of NSW is marking History Week from 7th to 15th September. The theme this year is “Picture This”, with the participants in History Week looking at historical images and the history which surrounds them. Berowra Living History has an amazing collection of Historical Photographs, and we invite you to celebrate History Week online with us. Scroll through our many blog and museum images and pause to look at a few that you particularly like. I have started the ball rolling with the image above, drawn from my favourites. It reflects the way in which Berowra Living History celebrates the history of decades ago, and the passing on of history. The image captures a special moment in local and family history and shows the continuing history of local families and the wider community. To see the original blog post, click here. Let us know which of our images speak to you. Good idea Ann. 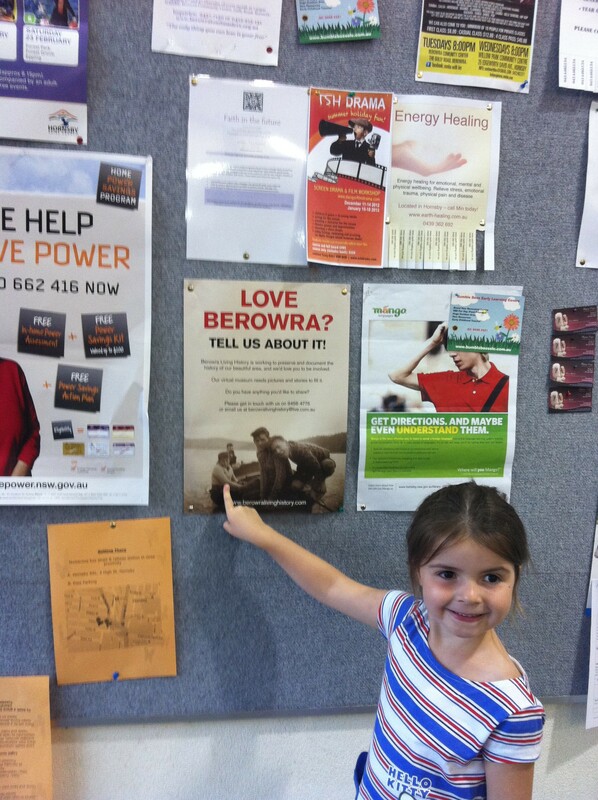 One which should encourage people to look again at our collection and respond as you suggest and perhaps provide us with more local history and personal accounts of life in our Lovely Berowra! One of my favourite images and intriguing blog subjects was Valerie Jameson (https://berowralivinghistory.com/2012/08/03/valerie-jameson/). It would be good to learn more about her music and her life. I am particularly fond of a few images in the Museum Of Berowra’s newest exhibition – The Mother, The Father and The Matriarch. I love the paintings by George Collingridge of Capo Di Monte (http://berowramuseum.wordpress.com/2013/08/13/why-did-george-collingridge-come-to-berowra/) They capture his home so well, and give us a glimpse into what Collingridge Point looked like over a century ago! As for photos, I have always said the image of Berowra Waters with the tourist buses would have to be one of the most striking (https://berowralivinghistory.com/2013/07/19/photographic-treasures/). Being a panorama it captures more of the scene, and it really does bring to mind those heady days when Berowra was a tourist destination! I was particularly interested in the photo of The Squirt (rail motor) at Berowra Station.The background shows interesting buildings that are no longer there. I,also loved the photo of the Squirt,and the well kept garden of the Berowra station.I used to catch the Squirt into Hornsby,change to another train,and travel to the city,where I worked.I had only been married a short time,and always enjoyed the train travel to work,along with the clicketty clack and other noises of the Squirt.This is a great photo ,and brings back great memories. Because,with many other volunteers i have fought fires all around Berowra, from all points of the compass,for most of my life. I can remember an early experience when Bill Gainsford, who was equipment officer for the local brigade, needed help with a small fire. These were war years, so all the young men were away. Bill could not put the fire out alone, so asked the school master could the big boys from sixth class help. We managed to put out the fire ,but after that the local mothers club put paid to this kind of volunteer work. Although all the boys had a great time. This whole blogs-comments part of the site is very well done – informative and interesting. I love those old photos of bygone days, especially the vehicles, buildings and the array of old school photos. Perhaps my favourite is that one on page 10 of the late Bill Foster talking to some school children about David Lever’s painting of Bill’s old family store. A great shot! Yes Gabe, that was a great moment to capture.